Home » Allgemein » Stream the Opening Ceremony and Concert live! You can not join Opening Ceremony and Opening Concert of ISWI 2015? 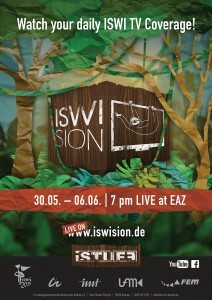 Then stream it live (Start: 7.30 pm Ceremony, 10.00 pm Concert) on: http://www.iswision.de/iswision2015/ ! Thanks to ISWISION and FEM! ← We ate, we laughed, we danced!